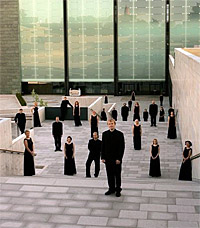 The Estonian Philharmonic Chamber Choir (EPCC) was founded in 1981 by Tõnu Kaljuste, who acted as artistic director and chief conductor for twenty years. From 2001-2007, Paul Hillier succeeded him, until Daniel Reuss took over in 2008. Over the years, the choir has established its reputation as one of the world's leading choral ensembles. Its repertoire extends from Gregorian chant to late Baroque and twentieth-century music, with a special emphasis on Estonian composers (Pärt, Tormis, Tüür, Grigoryeva, Tulev, Kõrvits, Tulve). The choir performs 60-70 concerts per season in Estonia and abroad. The EPCC has worked with a number of acclaimed orchestras and conductors, including Claudio Abbado, Helmuth Rilling, Eric Ericson, Ward Swingle, Neeme Järvi, Paavo Järvi, Nikolai Alekseyev, Andrew Lawrence-King, Roland Böer, Frieder Bernius, Stephen Layton and Marc Minkowski. It has performed at such music festivals as the BBC Proms, Edinburgh Festival, Abu Gosh Music Festival, Moscow Easter Festival, Musikfest Bremen, Salzburg Mozartwoche and Festival Aix-en-Provence. The choir has made numerous acclaimed recordings, with one Grammy Award for Best Choral Performance and eight nominations.